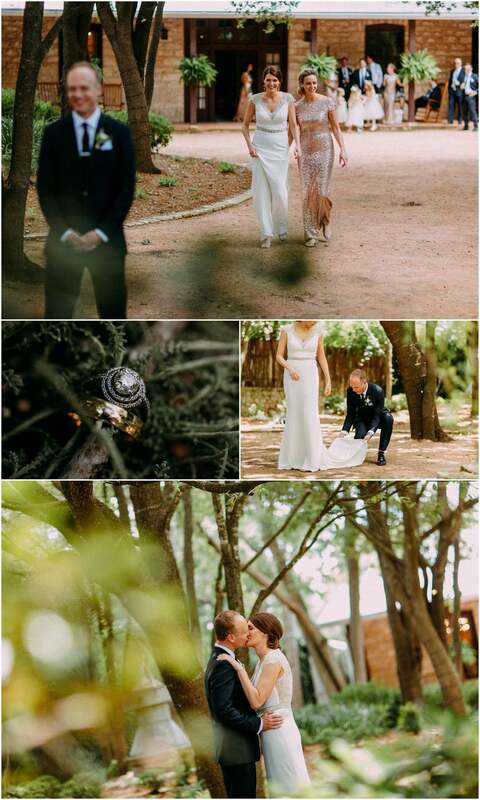 Mary Kate and Chad were such a fun couple to work with this past summer. They have a brand new baby girl, Katherine, who attended most of our meetings and was the center of attention! Mary Kate is the Spa Director at the Four Seasons in Austin and Chad is the Executive director of the Hill Country Film Festival. 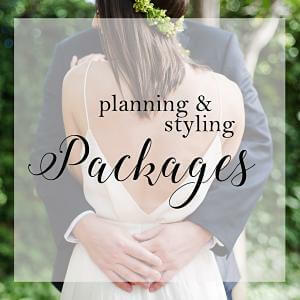 They have thrown and attended a lot of parties and wanted their wedding to be an elegant affair. 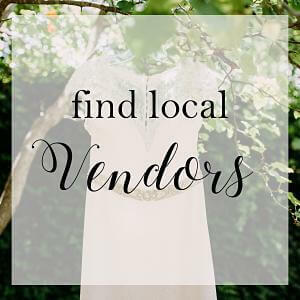 They envisioned a classy, well styled party, in the intimate destination setting of Fredericksburg, and chose all of the best vendors to make it happen. 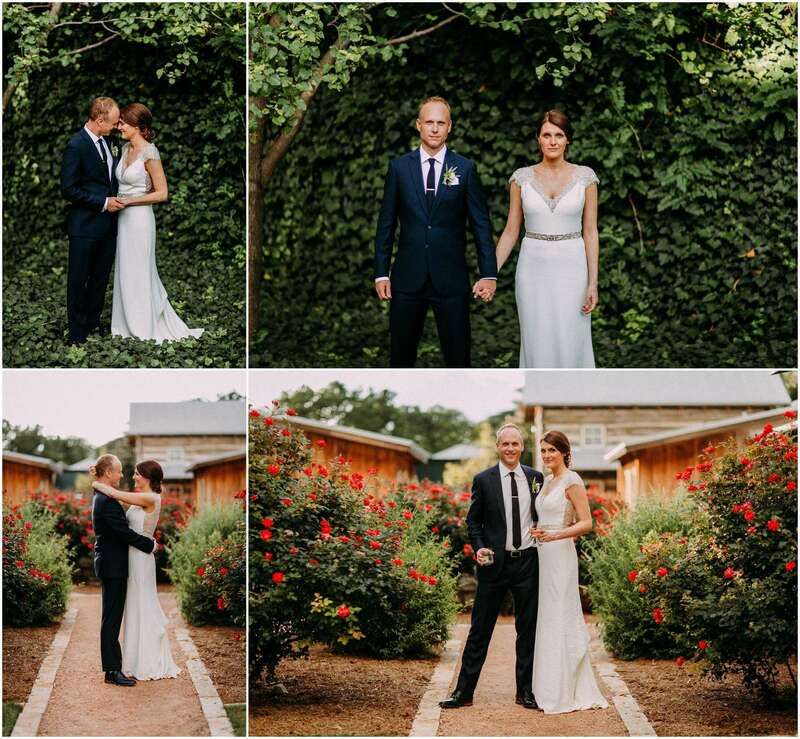 As soon as they got engaged they knew the perfect place to host their wedding would be Hoffman Haus in Fredericksburg. 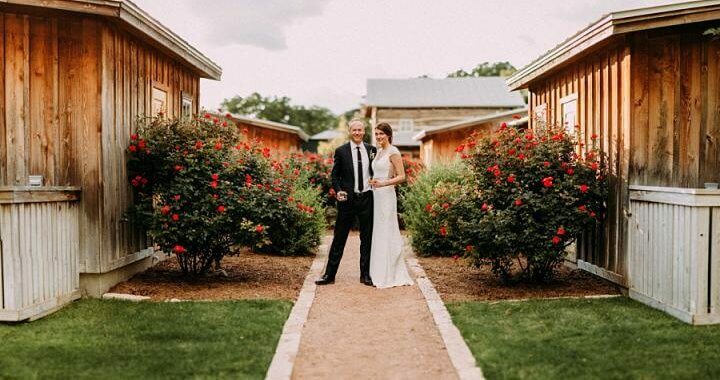 They had the pleasure of hosting several Hill Country Film Festival events with Hoffman Haus in the past and knew the quaint charm, dedicated staff, and downtown location was the ideal setting for their wedding weekend. 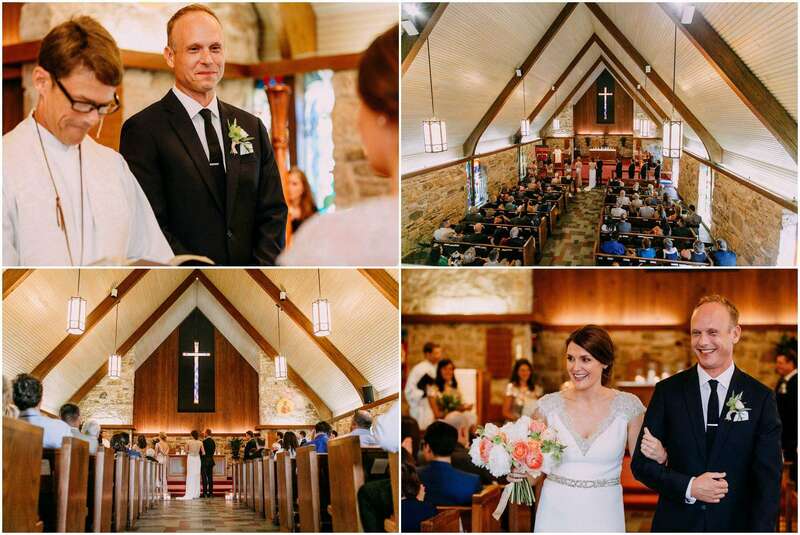 In the tradition of the Bride’s family, the ceremony was held at St. Barnabas Episcopal Church. Candles adorned the aisle as 4 flower girls carried fresh garlands to the altar. 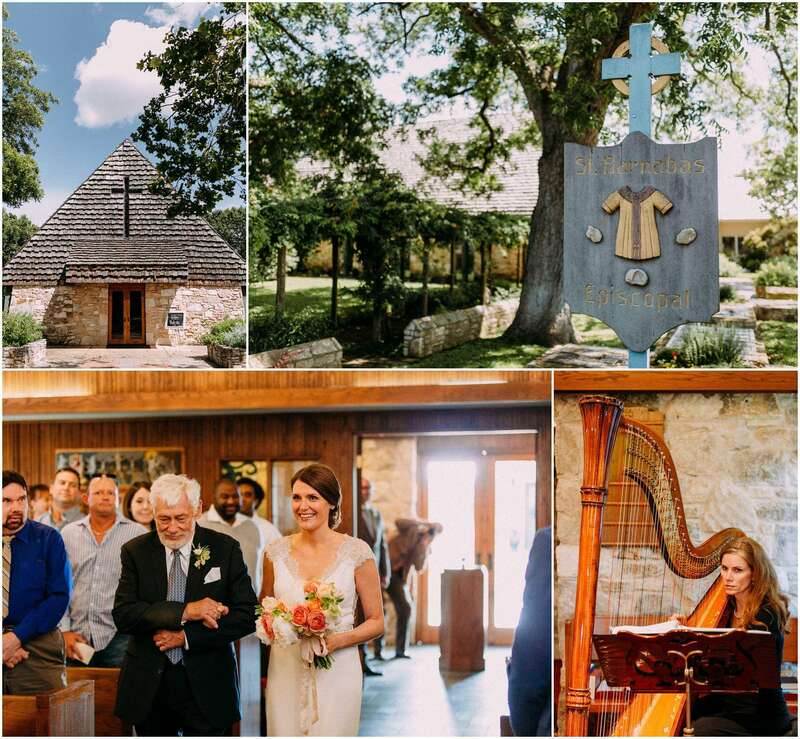 Stephanie Nash of A Heavenly Harp provided the elegant and romantic ceremony music. Mary Kate wore Badgley Mischka and looked stunning. The subtle elegance suited her perfectly. Those sassy shoes are Jimmy Choo, of course! 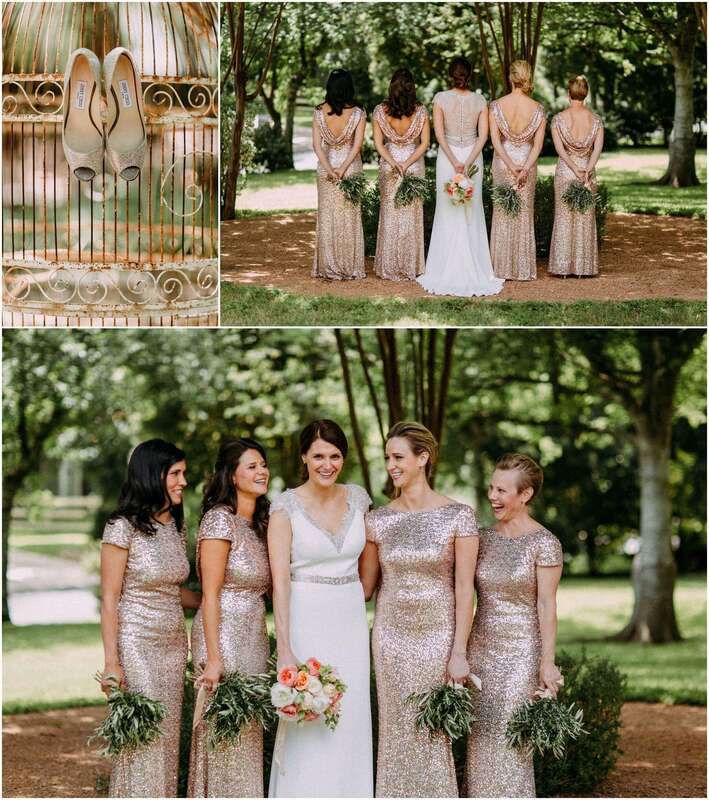 Her bridesmaids also wore Badgley Mischka sequined dresses, rented through Rent the Runway. The gents wore this great combo (that I’ll take the credit for suggesting) of navy suits and black ties, rented through The Black Tux. 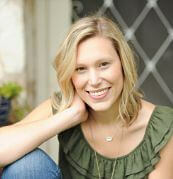 Hair and makeup thanks to Brandy Pate and a talented friend. The couple chose the amazing Sprout Floral for the arrangements and centerpieces and they did not disappoint! 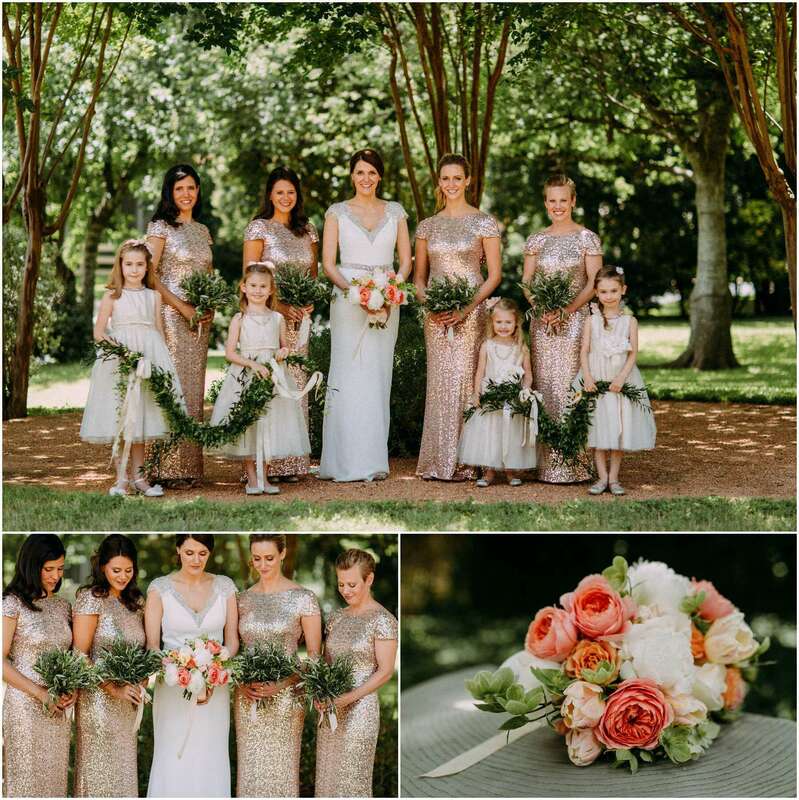 The girls carried olive branch inspired lush greenery bouquets to keep the gold dresses from being too formal. The greenery runner and clear vases on the head table gave it a really organic feel. 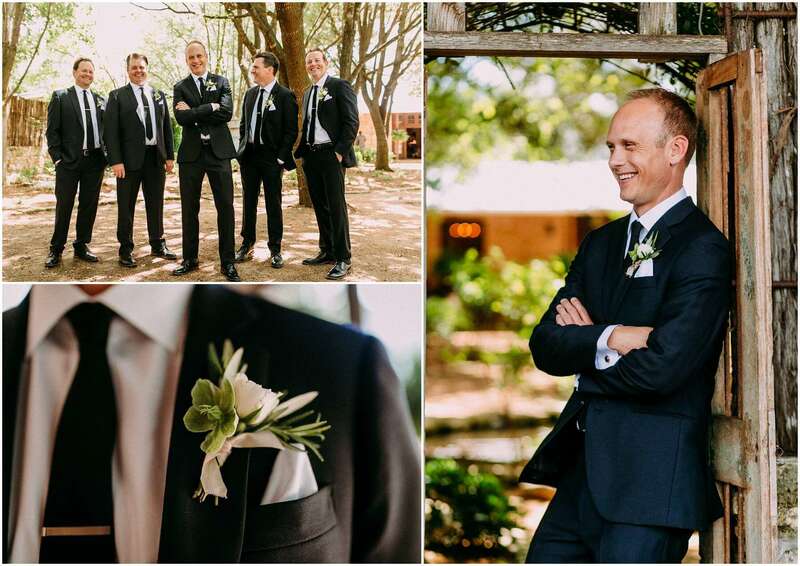 We chose a neutral classic pallet of gray and navy, with hints of blush, and pops of gold. 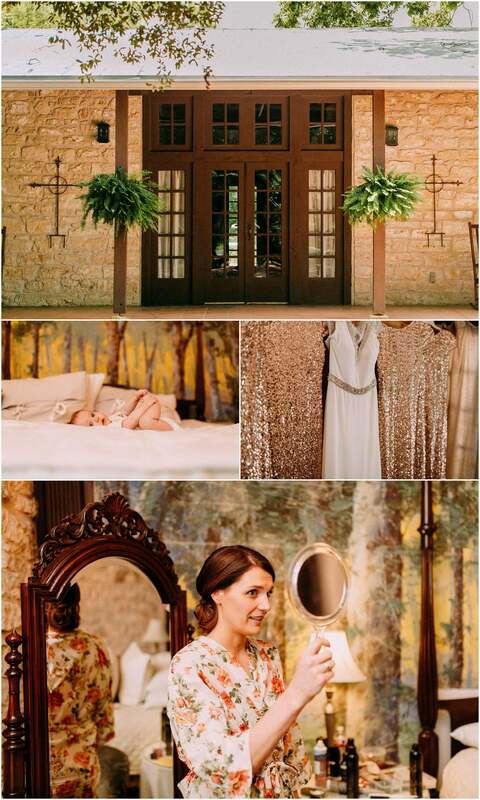 Chad wasn’t crazy about the idea of golds and sequins, but I think he liked it after seeing it all come together so elegantly. Mary Kate really liked these gold pillows, they were a little surprise I added in at the last minute. 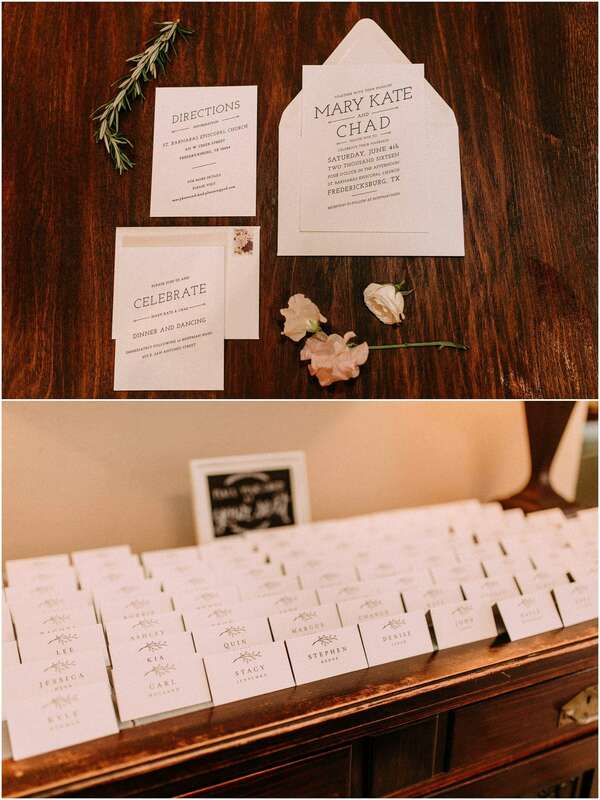 Mary Kate picked a great suite from Minted for her invitations. A slightly more modern font, with blue lettering and a white background. The font of these almost reminds me a little of the movies… how appropriate! 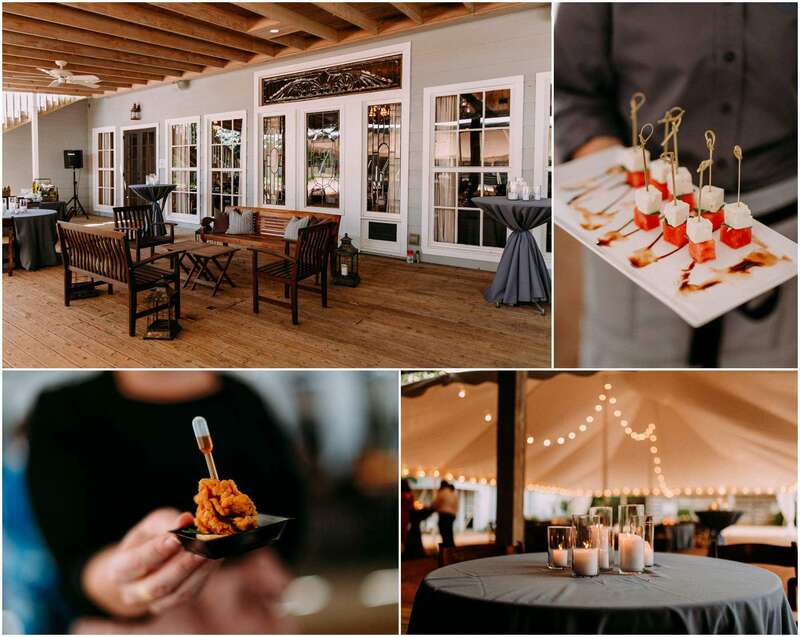 Cartewheels Catering provided their usual outstanding service and presentation. The chicken and waffle bites were my favorite! They are sooo tasty and equally adorable. Yes, that’s an individual sprig of rosemary and dropper of maple syrup ON. EACH. ONE. Whoa, the details. Sophie’s did an excellent job on the tasty cakes. 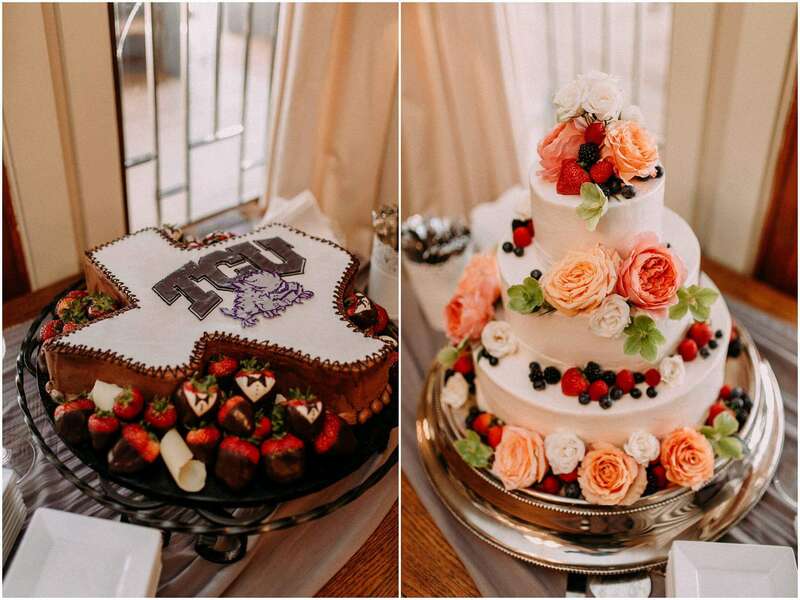 Mary Kate and Chad designed that TCU cake themselves! I was so psyched when Mary Kate decided to use Quintessential Chocolates for her favors. I found this amazing chocolate place not too long before her wedding and suggested it. Once you have them, you will never eat regular boxed chocolates again! They are made right here in Fredericksburg, so it was great local treat. 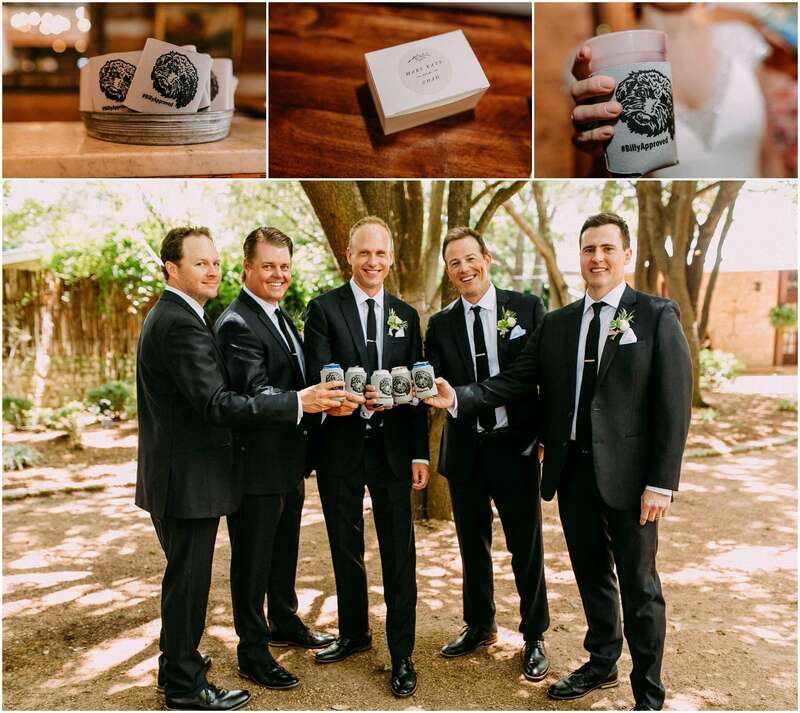 Benjamin Garrett did a great job with these photos and captured some of my favorite moments on camera. One of them is the photo directly below. While he was shooting he almost fell into the coy pond and his assistant captured their faces. It’s was hilarious! 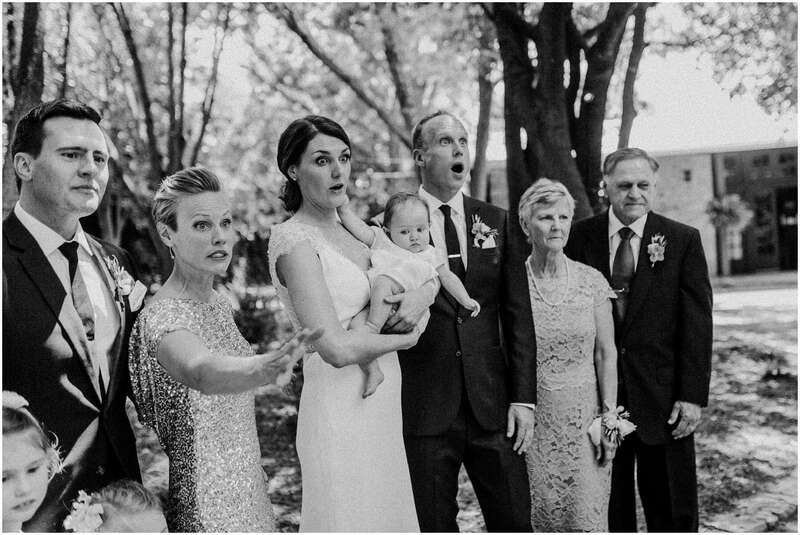 Amy (Sister of the Groom) gets the winning award for being most dramatic. My second favorite part of the evening was when Benjamin took them out for some photos in this lovely evening light. It was a little break from the crowd where they got to be sweet on each other and absorb the moment. Plus, Chad emphatically explained his gratitude for me keeping his gin and tonic constantly refilled. Ha ha. He had a few of them by this point.